Heat 2 teaspoons vegetable oil in a large skillet over medium heat. Add tofu and cook until browned on both sides, about 10 minutes. Add 1 tablespoon soy sauce and toss; cook 5 more minutes. 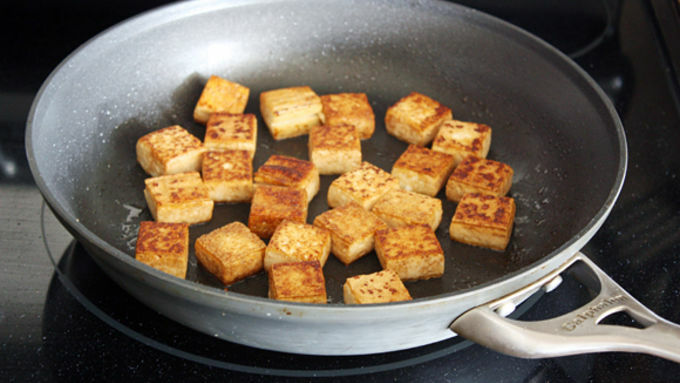 Remove tofu from skillet and set aside. 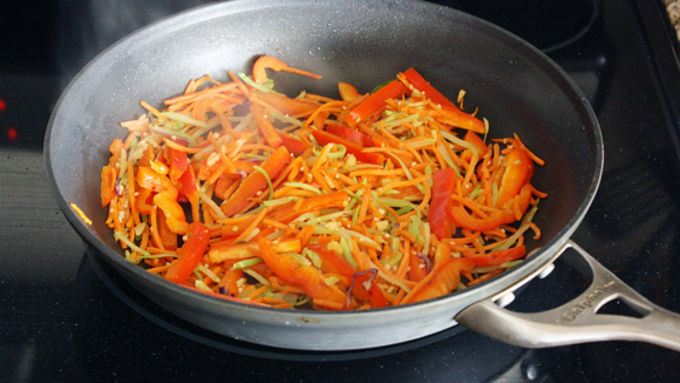 Pour remaining 2 teaspoons vegetable oil into skillet. Add cole slaw mix, bell pepper, minced ginger, minced garlic, red pepper flakes and sriracha; stir to combine. Cook, tossing occasionally, until bell pepper is soft and slightly charred, about 5-10 minutes. Add remaining 2 tablespoons soy sauce; toss to combine. Cook 3 more minutes. Add plum sauce and stir. 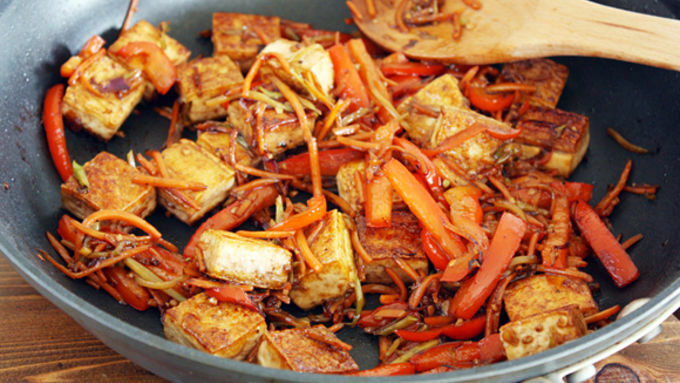 Return tofu to skillet and toss to combine. Remove leaves from head of lettuce; wash thoroughly and pat dry with a towel. Spoon tofu mixture into lettuce. Garnish with green onions and cilantro before serving. Well well well…what do we have here? We’ve got tasteful, healthful, spicy-ful, veggie-full goodness, that’s what! Before you spitter and spatter at the idea of a lettuce wrap – especially one filled with tofu – let me tell you that this one is different. No, really. It’s tossed with soy sauce and plum sauce and sriracha and garlic and all sorts of other good stuff. It’s tucked inside a wrap of buttery-soft lettuce. 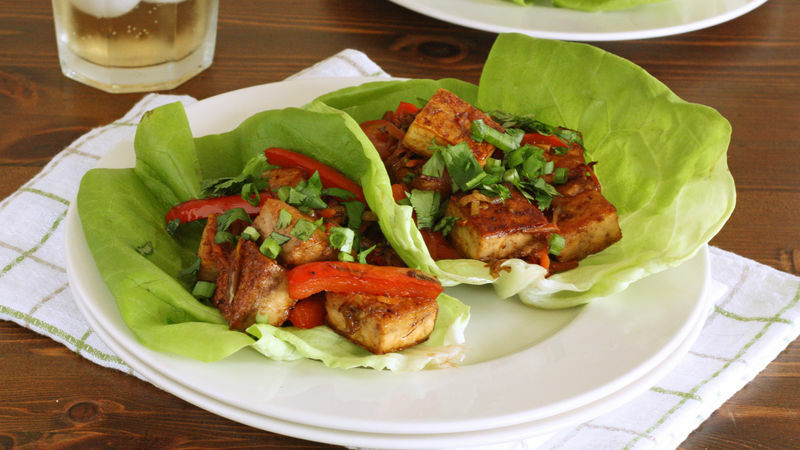 It's a game-changer for anyone doubting the tastiness of tofu lettuce wraps. And it’s delicious. The best part is it’s low-carb, so your post-holiday waistline won’t mind it, either! Of course, this ain’t the only way to add veggies to your daily diet, no sireee. Here are a few other ways to do it that you’ll love so much, you won’t even miss the meat.